Republican County Clerk Chris Jacobs has released a video promoting his candidacy for the State Senate, distributed on his Facebook page and via YouTube. The 60th Senate seat is at the crux of power in New York State — potentially holding the Senate chamber in the balance. In the video, Jacobs casts himself as the hometown son of Buffalo who will fight for upstate – a region that he says is ignored by the Democrat-dominated power structure in Albany. For the Republican Party, control of the Senate is the only foothold of power in State politics. The State Assembly is heavily weighted with Democrats holding a lopsided majority. Republican Party State Chairman Ed Cox and Independence Party Chairman Frank MacKay are banking heavily on Jacobs’ candidacy. Jacobs lists his wide-ranging accomplishments – from founding a scholarship fund for inner city children to pioneering work as a real estate developer who revived sections of downtown when no one else would. Kevin Stocker pictured with family. Jacobs, however, is facing Kenmore attorney Kevin Stocker, a slightly more conservative figure in the party who won the Republican primary two years ago against incumbent Senator Mark Grisanti by an impressive margin. This year’s primary could see candidates spending more than $1 million. It is expected that downstate money will pour into the district (largely in support of Jacobs) to try to hold on to this tipping point Senate seat. Stocker, who has been going door to door across in the district for months, seems to have a deep relationship with a faction of committed primary voters. He rails against party bosses, downstate influence over Western New York, and special interests that he says control Albany. Stocker is also slamming Jacobs for his fundraising behavior and close ties to party bosses in Albany. On Facebook, Stocker shared an invitation to a $99 per person fundraising event [sponsorship go for up to $2000] that lists a host committee which is a Who’s Who of influential scions in the business and legal community: Horace Gioia, Charles F. Hunt, Paul Kolkmeyer, Howard Saperston III, John Sinatra Jr, and Rocco Termini, Brendan Kelleher; and prominent attorneys Terrence P. Flynn, Richard A. Grimm III, Karen L. Cook, Henry Wojtaszek and Peter J. Martin; among others. Stocker includes in his post a scathing commentary not typically seen from a Senate candidate, which may mark a departure from the well-mannered (perhaps even tepid) rhetoric that has characterized his past campaigns for the 60th district seat. Stocker promises to make the issue of party bossism and political corruption the central themes of his reform agenda. 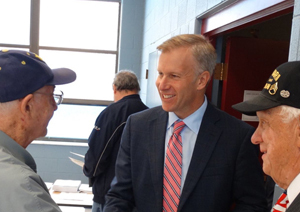 Chris Jacobs on the campaign trail. In the heavily Democratic State of New York – dominated by New York City voters – the State Senate is the only lever with which the Republican Party is able to exert influence in State politics, and to do so it must partner with a small independent faction of Democrats. Control of the chamber has hung in the balance in a succession of pricy 60th district elections. This year could be the most expensive and – with presidential candidate Donald Trump expected to be on the ballot in a general election – Republican turnout could be sweeping in 60th district communities like Orchard Park, Hamburg, and Grand Island. Even Tonawanda, a Democrat stronghold where both Jacobs and Stocker have performed strongly in past elections, could swing to the GOP. 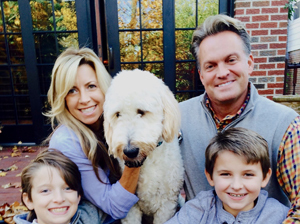 Chris Jacobs has not yet made his intentions to run for State Senate public, but sources say that Erie County GOP Chairman Nick Langworthy is pushing the County Clerk to challenge Kenmore attorney Kevin Stocker for the 60th district Senate seat.